Earlier this season, Georgetown shot 36.4% from the field and scored just 37 against Tennessee. That was the Hoyas' lowest point total since 1984. Fortunately for them, the Volunteers managed only 36 points. As the season progressed, that narrow victory has come to define this year's Georgetown team. They have used their elite defense, which is surpassed only by Pittsburgh in the Big East, to overcome their 274th ranked offense. The Hoyas have limited their opponents to a meager 36.7% shooting, the second best mark in the conference. 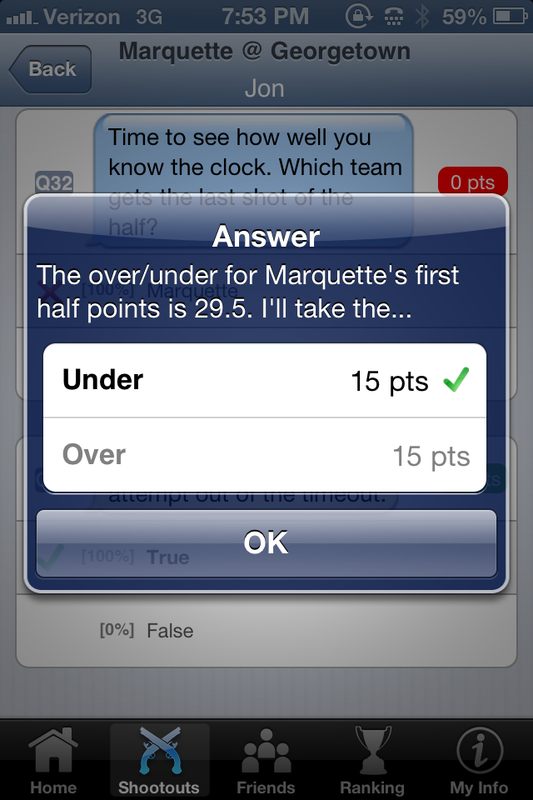 However, coming into tonight, Marquette was averaging 70 points per game. So the stage was set for a battle of strength vs. strength -- the Hoyas' tenacious defense vs. the Golden Eagles' dynamic offense. In the first half, Georgetown forced 12 turnovers and kept Marquette to 23 points. The Golden Eagles did shoot a respectable 50% from the field, but could only get off 18 attempts. And while Georgetown's offense can be abysmal at times, tonight's victory proved that their defense is strong enough to keep them in any game. 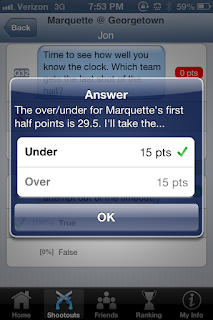 As the related first half SnapCall indicates, Marquette fell short on offense, and the under was the correct response.